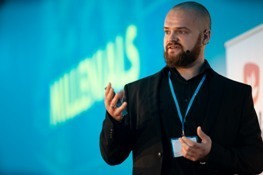 The keynote of this year was Sean Pillot de Chenecey, strategic consultant who’s worked on strategy projects for brands around the world for over twenty years. 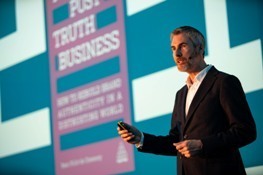 He introduced the thoughts of his recently published book The Post-Truth Business, the first study on the impacts of current post-truth era on commercial brands. Brands cannot exist without trust and people in the role of consumers desperately look for something they can rely on. The polarization of society is pervasive and relationship to brands is more than ever affected by scepticism and cynicism. The basic pillars of the brands must therefore be authenticity, transparency, credibility, respect for privacy and empathy. And also consideration of the fact that the opinion neutrality is no more possible. Sean de Chenecey mentioned a very timely example of the last campaign of Nike with a professional American football player Colin Kaepernick. He became famous after he had expressed disagreement with the police violence against ethnic minorities by kneeling during the American national anthem at the stadium. And has not changed his attitude even after it he was dismissed out on the sport club. Nike accented his story in the campaign using the slogan "believe in something, even if it means sacrificing everything." Sean believes that such clear messages are needed. "If we do not have a clear attitude, we risk that actually we support something what we don't want to be connected with," he said. The crisis of confidence and overall social polarization has resulted in the inability to accept different opinions. Our opponents are perceived as our enemies that threaten us. "It is necessary to deal with such a situation and you as the marketers are not standing outside the system. On the contrary, you should bear your share of responsibility," said Jakub Macek, a sociologist working at the Masaryk University in Brno. 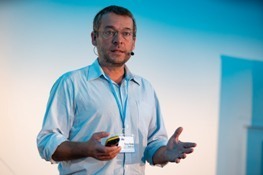 Also Šimon Pánek, the Director of the non-profit organization People in Need spoke in a a similar way. He pointed out: "When your brand is advertised on sites that support the Kremlin's propaganda or neonacism, you are in fact co-investor of these sites“. The way to improve it is not in censorship, but in activities resulting from the "bottom". As an example, he mentioned the Slovak platform Konšpirátori.sk, which creates a database of Web sites with lying, fraudulent, conspiracy or propaganda content. "Also the Slovak police or the public prosecutor's Office deals five times more often with published statements of incentives to violence than in the Czech Republic“, said Šimon Pánek. 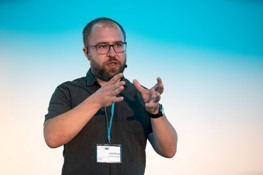 Jaroslav Malina, Digital Chief at McCann Prague, raised the provocative question of whether brands represented by conference participants will survive the year 2030. Consumers from the Z generation are much more than their predecessors interested in stories and relationships, you are able to create by brands. As an example, he mentioned the retail store Story in New York, which combines a classic art gallery with retail and with something like 3D life stylish magazine, changing its content every month. Recently Story was bought by Macy's with the aim to spread this concept to all brick mortar stores of this chain. "Retail as we know it, as well as the classic business models are definitely in danger, but we can also perceive it as a huge space for new opportunities," Malina added.